According to the “Trees of North America” field guide, seven species of spruce trees are native to Canada and the United States. The North American spruces grow in cool regions such as the Rocky Mountains, Canada or in the northern tier of states in the United States. Nearly 40 types of spruces exist worldwide, all growing in the cooler climates within the northern hemisphere, with 18 types in China alone. It is possible to identify the North American spruces by evaluating several aspects of the tree. Study the shape of the tree. The spruce tree grows straight and tall and the branches emerge from the trunk in a circular, or whorled, pattern. Most spruces have a narrowed conical shape. Make a rough estimate on the height of the tree. Some spruces are simply too tall to gauge their height correctly, but are so tall that you will have a good idea which species it may be. For example, the Sitka spruce can be more than 200 feet tall—the tallest of the spruces. Other spruces are more medium-sized species, such as the 60- to 70-foot tall red spruces. Examine spruce needles carefully in regard to their color, shape, length and sharpness. Looking at the needles of a white spruce, for instance, you would discover they are from half an inch to three-quarters of an inch long and prickly at the ends. Cut one in half and you will notice they have a four-sided appearance in cross-section. The white spruce has green needles. Spruce needles grow singly from the twigs, coming out of what looks like a peg on the branch. Observe the cones that develop on spruce trees. 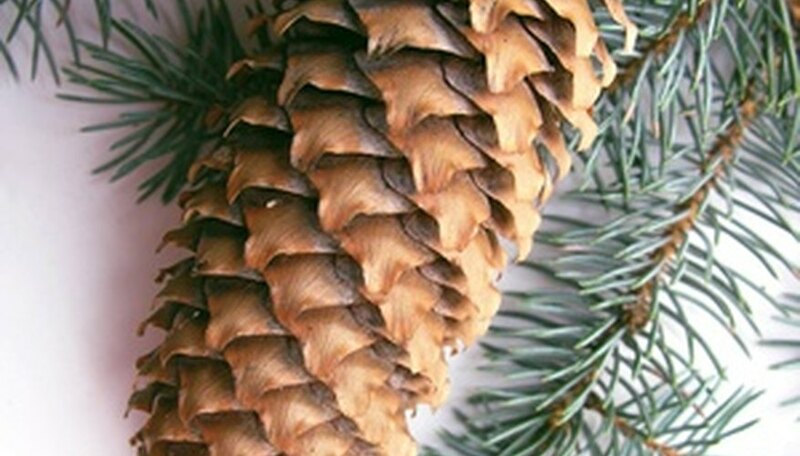 Spruce cones are much lighter than the typical cones you would find on a pine tree. The woody scales that compose them are thinner. The black spruce produces a cone rarely longer than an inch and is quite brittle to the touch. The blue spruce has 3.5-inch long cones on average, while those of a Brewer’s spruce are as long as 5 inches and a combination of green and purple shades. Look around where you find a spruce tree growing to help you identify the species. Only three spruce types grow native to the eastern part of the northern United States—black, red and white spruce. The other four native species all exist in the Rockies or the Far West. Spruce tree habitat can reveal its identify. Consider, for instance, that the black spruce typically grows in wet boggy ground, while red spruce flourishes in stony mountain soil. Spruce trees often will grow together and form stands of a large number of trees, another clue you can use to recognize them.